Enjoy this mini podcast on the interesting things that Kelly and Angela saw and did at the San Diego Comic Con while presenting at the Educators Conference. Find out what made Kelly angry this time! And what comic did Angela give much love to after winning an Eisner this year? You’ll have to listen to find out! Hint: It’s nuts! Episode 3: Genre, or what’s the deal with sports manga? Podcast updates every other Monday. In this episode we ask why American comic books are stuck on superheroes while manga seems to have it all. This is also the episode where Angela breathes heavy with pneumonia and Kelly gets angry . . . again. Find us on the iTunes store! Episode 2: Art, or why is manga in black and white?! Welcome to the second episode, in which we find Kelly and Angela arguing about art and sharing their favorite artists. Who will win the epic struggle? Black & white vs. COLOR! Episode 1: Entering a new fandom, or…why doesn’t anyone like me?! 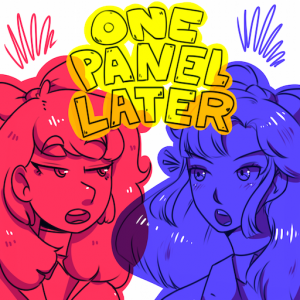 Welcome to the first episode, in which we find Kelly and Angela arguing about how gosh darn hard it is to get into comics and/or manga. Our Please Explain segment features Kelly explaining why honorifics are used in Japan, much to the confusion of Angela.